If your idea of hell is sitting in the same seat for 24 hours – it’s no wonder so many people reach for liquid entertainment on long haul flights. 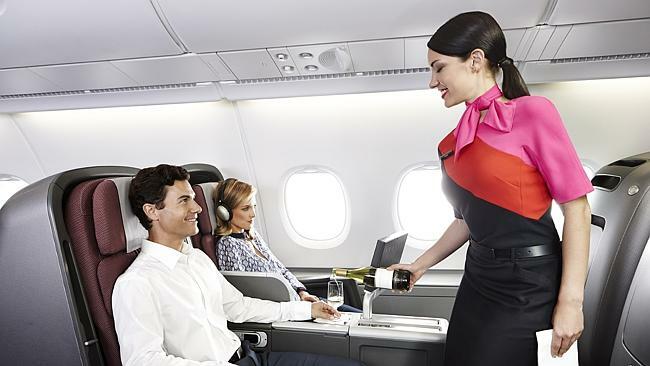 However, a different kind of entertainment is now brewing for Qantas: a showdown between winemakers and sommeliers – and it’s all being fought at 30,000 feet. Tonight in Sydney, Qantas officially announced it had replaced its multi-award winning wine selection panel of Steve Pannell, Vanya Cullen and Tom Carson, with a new team of wine experts and mixologists from the Rockpool Restaurant Group. Under the guidance of celebrated chef Neil Perry, the team will select wine, champagne, spirits and other beverages for Qantas domestic and international flights and lounges. “Qantas’ new holistic approach to food and beverage will mean not only matching our menus with the perfect wine, but with the perfect cocktail or champagne,” said Gareth Evans, CEO Qantas International. According to my source inside Qantas, the new list will be more of an evolution than a radical revolution. Highly influential wine writer Huon Hooke is reserving his judgment for now despite voicing his concerns in a recent blog post in which he questioned whether Neil Perry’s crew has what it takes to maintain an industry-high standard of economy class wine and whether he is spreading himself too thin. While Steve, Vanya and Tom all have illustrious wine industry careers and took a great deal of pride in their Qantas work, I think Huon is overlooking the skills of the new team. As a former sommelier myself, I know how important the art of food and wine matching can be. When done perfectly, it can elevate the meal to a whole new level. And by the looks of things, the Rockpool crew isn’t your ordinary group of sommeliers. Among the group is the Head of Sommeliers Australia, David Lawler, and one of only two Master Sommeliers in Australia, Sebastian Crowther. These guys live and breathe Neil Perry’s food, so you would expect them to know a thing or two about what wines are a perfect foil to Neil’s food. And this actually brings me to a very humorous point: I remember first being invited to a Qantas wine launch 18 years ago as a young wine writer. The big news of the days was Qantas’ announcement that Neil Perry had joined its ranks. With the one and only Len Evans on the stage, surrounded by his then wine selection panel, I dared to ask why there were six chardonnays represented and only one Riesling. “Surely that can’t be right, Neil Perry’s food has got so many Asian influences?” I said at the time. Sidenote: I was also a sommelier at the time for über-chef, Christine Manfield. SHOT DOWN IN FLAMES! That’s the only way to describe the scolding I received from Len Evans. How dare I question his panel on food and wine matching! Thankfully, times have changed for Qantas. I do remember travelling to Hong Kong two years ago at the pointy end of the plane – the wine list was superb, and I was very proud to report, Qantas’ selection panel had now got the mix right. Let’s give the Rockpool Group the benefit of the doubt. While they have very big shoes to fill, I’m confident these sommeliers will be raising our food and wine entertainment to a new level. And trust me – I will be watching; just from the other end of the plane! What’s being served in First class this evening on all A380s flying around the globe? Next 10 things you need to know about Greek wine! I’ve always questioned the wisdom of pairing drinking with flying, and I’m a huge wine fan, known for having a glass or two mid-flight. But so many people have anxieties and take meds that don’t mix well with any type of alcohol. At least it sounds as if we won’t be risking bad wine choices–that’s certainly a plus!!! You had me at “panel of experts”. Compared to our most recent flight on a regional US airline, where we were offered a local wine (Infinite Monkey Theorem) in a can, paired with a can of Pringles, we’ll take it! Interesting. I hope you will keep us posted on the changes. I have never flown Quantas but have always heard it is a great airline. Cheers! This sounds interesting! After my first drinking experience on a plane (let’s just say I didn’t realize you get drunk a lot faster in the air), I stick to one drink per flight. Great wine list, but will the food measure up? That’s it for me with Qantas if they take Taittinger Comtes off their wine list. Nicely done. While the international airlines seek ways to entice our airlines cut and cut some more. Even in the pointy end of the plane we are lucky to be offered water in a plastic cup. I would love to fly Quantas someday. Here on domestic US flights, the wine offered up is terrible to say the least. I usually stick to water or fruit juice. Years ago, I started flying international long hauls for work, mostly for business, but other times for vacation. When flying for work, I was lucky enough to fly first class where they would serve Dom Perignon before take-off. I would politely decline a refill and the flight attendant would say, “Aw honey, we’ve got 15 hours (Chicago to Hong Kong), drink up.” So of course I did and quickly passed out within an hour after take off. These days, they only serve sparkling wine and not Dom. So I reserve my wine quota when eating dinner. And yes, I don’t pass out anymore after the 2nd glass, even at altitude. I look forward to flying Quantas soon. Hi Conrad. I would have to have plenty of wine to fly. Thank you for liking my poem Escalator! Best Wishes.The Foureyed Poet. This is all complimentary? Even in economy class?